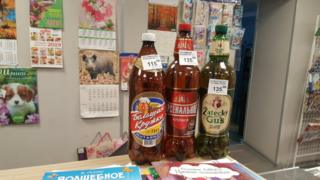 Russia's beleaguered mail service plans to keep local post offices open by letting them sell beer. Among the first to notice the new goods on sale was a caller to a post office in Murmansk Region, in the far north of the country. "It looked like Russian Post couldn't sink any lower, but it turns out they could," he complained, taking to the VKontakte social media platform with photos of beer stacked up for sale at the counter. This left only one cashier position free, which was "already witnessing an involved discussion about bed linen. So now we can expect the local winos to hold things up even more," he lamented about the bottles, priced at up to 135 roubles ($2; £1.60) a piece. Comments on the VKontakte page also mix exasperation with humour, while some comfort themselves with the thought that at least they "won't get bored in the queue anymore". Others think it is only a matter of time before the post office starts selling kebabs too. "What about condoms, cigarettes, and a couple of tables in the corner as well?" another user suggests. The story quickly made its way to the national media, which found out that the ale sale is not a one-off initiative at all. The Murmansk post department says 40 of its 152 branches already have "low-alcohol drinks" - meaning no wine or spirits - for sale, in the interest of "increasing the viability of post offices and attracting additional money to modernise the network," according to Interfax news agency. But northerners aren't the only ones who can enjoy a chaser with their stamp purchases. Saratov Region far away to the south has also been experimenting with sales of beer and the fermented bread drink kvass as a way of "keeping unprofitable post offices open", the Komsomolskaya Pravda tabloid reported. Russian Post's press secretary Daniil Skidan sprung to the defence of the policy, which Interfax says has prompted "largely negative or satirical reactions". He told Govorit Moskva radio that they plan to roll out beer sales at 3,200 post offices across the country, but was anxious to point out that this was not just about making money. "The main focus is on rural branches, which will give the public access to high-quality, legal alcoholic beverages," he said. "This is important because over 1,200 people are poisoned by low-quality alcohol every year." Russian Post has come under government pressure to modernise in recent years, given frequent complaints of inefficiency and even mail theft, and this includes boosting its earning power. But it's not good news all round. Mr Skidan had to disappoint thirsty Muscovites, as branches in the capital will not be offering beer for sale alongside the brown paper and string.